A new GIMP version is out after 5 months of development. Unlike previous major versions of GIMP, the 2.10 branch allows some new features and enhancements to be added to the stable releases, and the latest GIMP 2.10.10 includes quite a few, including some notable Bucket Fill tool improvements, parametric brushes now support 32-bit floats, and more. 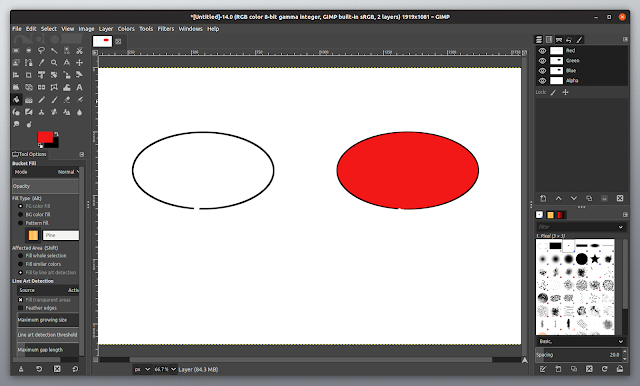 GIMP 2.10.10 comes with 3 Bucket Fill tool improvements. The most important one is a new Fill by line art detection (smart colorization) option. This was initially created for the G'MIC plugin suite, and it consists on an algorithm that fills areas surrounded by line arts without leaving unfilled pixels near the lines, while also closing not properly closed (holes in the lines) zones, so the color doesn't leak outside. This feature is explained in detail on girinstud.io. It's now also possible to pick colors by using Ctrl + left click (while the Bucket Fill tool is selected), without having to select the Color Picker tool. And the last Bucket Fill improvement is the ability to continue filling more areas by keeping the mouse button down while using Fill similar colors and Fill by line art detection modes. Another interesting enhancement in GIMP 2.10.10 is the ability to use the Healing tool to paint changes on a different layer so the original remains unchanged, using the Sample merged option. The Heal tool has had this option in a very long time, but it didn't actually work until this new GIMP 2.10.10 version. The Clone tool, which already had this option, was updated to work in a similar way. Yet another improvement in the latest GIMP release is support for 32-bit parametric (vector) brushes. Using parametric brushes with a 32-bit float fixes posterization in large brushes, especially with darker colors. Raster brushes are still 8-bit, but converting them to 32-bit float is a planned feature. Also, plugins can only use 8-bit versions of high-precision brushes and patterns, until a new API is released (not yet available). GIMP is available for most Linux distributions in the official repositories. If you're not using a rolling release Linux distribution though, it may take some time until GIMP is updated by your Linux distribution. The easiest way to install the latest GIMP on Linux is by using Flatub or the Snap Store. To be able to install the GIMP package from Flathub, see the Flatpak quick setup page and follow the instructions from there, then visit the GIMP Flathub page and click the install button. If you're a Gnome user, you can also search for it on Gnome Software / Ubuntu Software and install it from there. GIMP can also be installed from the Snap Store, but it has yet to be updated to the latest version at the time I'm posting this article, though the update will probably be available soon.